Sponsored post written by me on behalf of Smithfield® Marinated Fresh Pork. #RealFlavorRealFast. The opinions and text are all mine. The following content is intended for readers who are 21 or older. 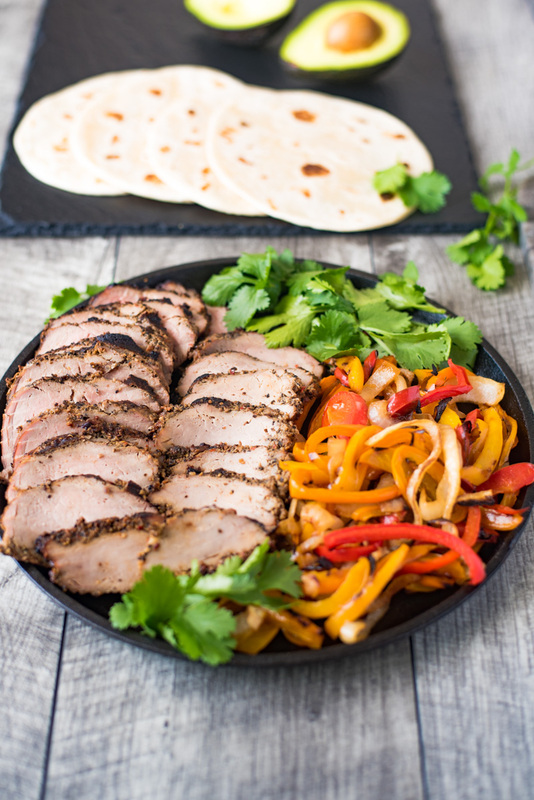 Grilled pork tenderloin fajitas are a quick and easy way to get a summer meal served in under 30 minutes. 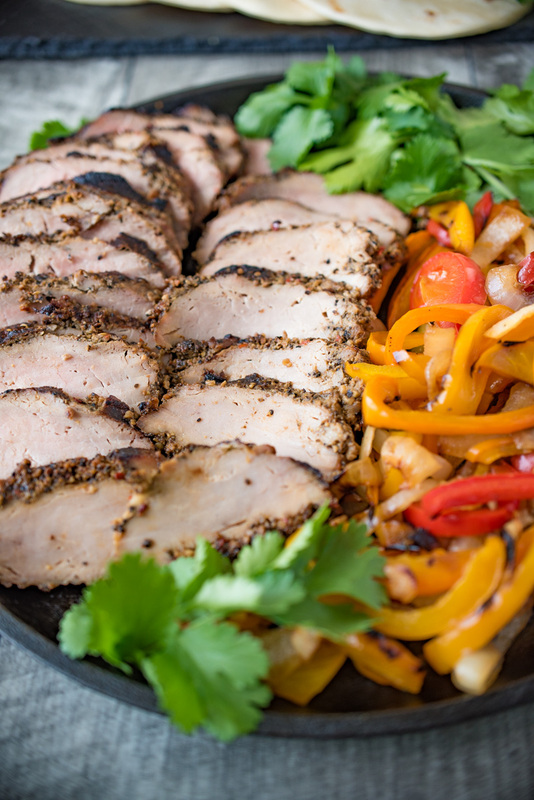 Marinated pork tenderloin is grilled along with onions and peppers. The pork is sliced then all are served on warm tortillas garnished with fresh avocado and cilantro. I’m so happy that grilling season is here because there is nothing I enjoy better than when the weather warms up and we start cooking and eating outdoors. 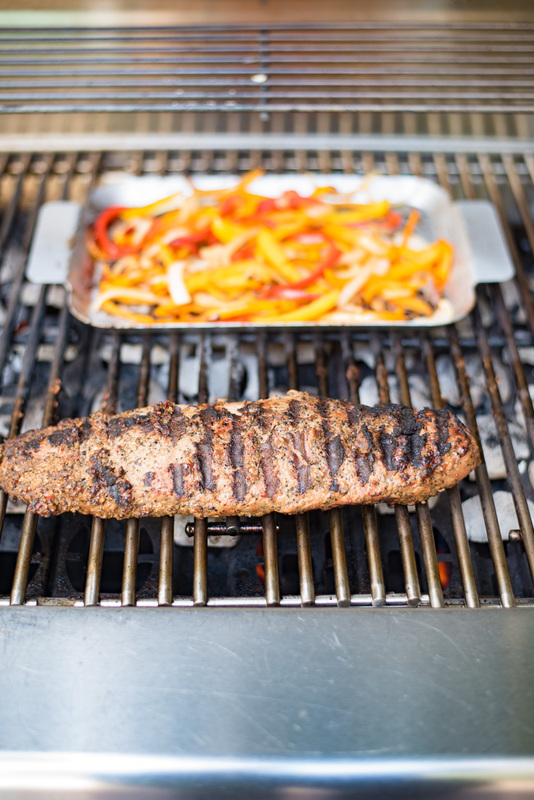 Spending the long days poolside and cooking up an easy meal like grilled pork tenderloin fajitas is my idea of relaxing and making the most of the weather. I am the one, of course, doing the cooking because I don’t lie in the sun, but I don’t mind because this recipe is so quick and easy. I like to serve the fajitas family style and that way everyone can help themselves, whenever they want. They’re easy to eat (no utensils, just hands) and cleanup is a breeze! With this recipe, I’m showcasing Smithfield Roasted Garlic & Cracked Pepper Marinated Fresh Pork Tenderloin. Pork tenderloin is marinated with delicious flavors of spices, dehydrated garlic and natural smoke. Buying the already marinated pork tenderloin not only cuts down on preparation time, but you also don’t have to go through the trouble of buying all the ingredients and then going through the waiting for marinating, it’s already done. Smithfield delivers Real Flavor, Real Fast. This and other Smithfield products can be found at your local Kroger store in the refrigerated meat section. Before you head out to the store, I have a coupon for you so you save $1 on one Smithfield Marinated product. For the coupon, click here. I love to eat pork tenderloin all year long and when I can grill it, even better. Pork tenderloin grills up so quickly and I love the crispy crust that develops on the outside that is created by the rub and marinade. Grilling the pork tenderloin on high heat leads to the best possible crust. For me, the crust is the best part and since I am the cook, I do have dibs on the crispy charred ends. With pork tenderloin being so lean it can get overcooked quickly, so I do have a couple of tips to ensure the perfect outcome. First, remove the meat from the refrigerator no longer than 1 hour before you are ready to cook it. This allows the cool meat to relax before heating it up and makes for more tender results. I also recommend using a meat thermometer to get the ideal temperature to avoid overcooking or even undercooking the meat. Pork tenderloin is recommended internal cooking temperature of 140°F and this reading should be taken at the thickest part of the meat. Resting after cooking is also important. This should be about 10 minutes before you start slicing. This ensures that all the juices stay inside for perfectly moist meat. We’ve all been impatient and sliced meat right off the grill and that’s when you see all the lovely juices running out. Patience does pay off in this instance. Another plus of grilling is being able to cook all the ingredients of a meal on the grill. Fajitas are a quick and easy meal and I like to cook the onions and peppers alongside the meat in a vegetable grilling tray on the grill then everything is ready at the same time. The fajitas are served on flour tortillas that are warmed on the grill. When the pork is done, it must be allowed to rest for 10 minutes, then sliced. 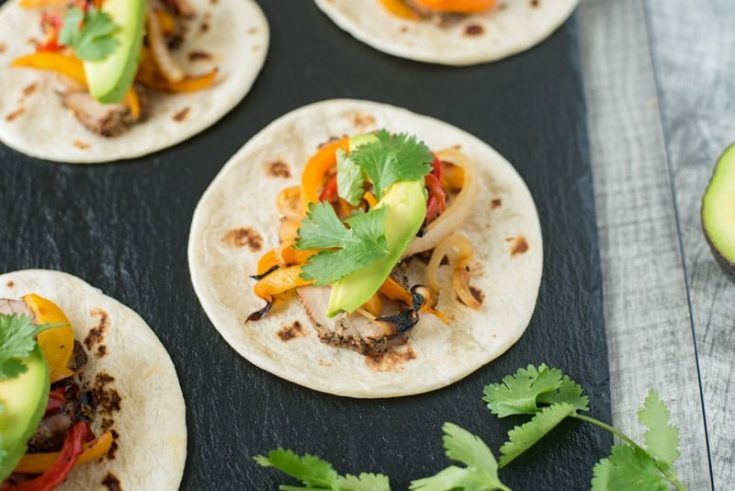 The slices are added to the warm tortillas, topped with onions and peppers and garnished with sliced avocado and fresh cilantro. A poolside meal in under 30 minutes, then normal activities can resume. Remove pork from refrigerator for 1 hour before cooking to allow to come to room temperature. Heat outdoor grill on high. Mix the onions and peppers with salt and pepper. Arrange in an even layer onto a vegetable grill tray. Once the grill is ready, add the pork, onions and peppers. Cover the grill. Cook the pork 15 minutes, turning every 5 minutes until the internal temperature is 140°F. At the same time you turn the pork, toss the vegetables until they get a little char. If they cook faster than the pork, move them off the grill and cover with foil. Once the pork is done, remove from the grill and allow to sit for 10 minutes before slicing. While the pork is resting, warm the tortillas on a cooler side of the grill, a couple of minutes per side. When the pork has rested slice into ¼ inch slices. 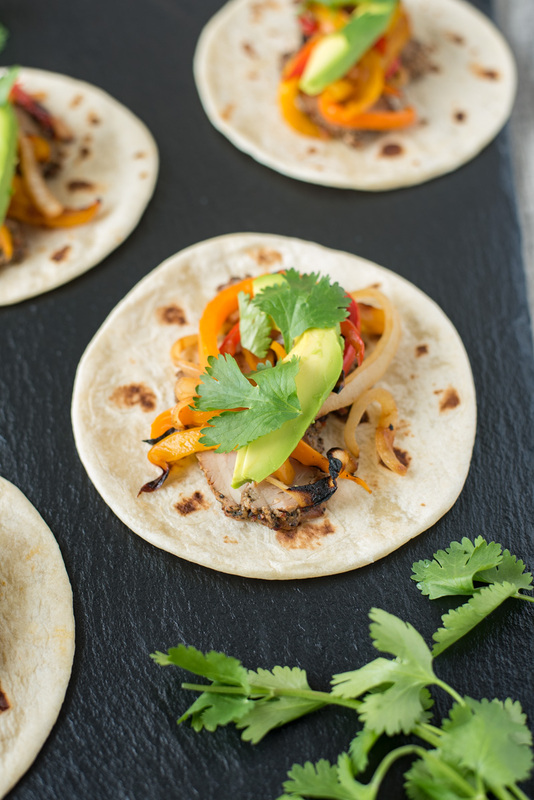 Add sliced pork, onions and peppers to a tortilla. Top with avocado slices and cilantro. I LOVE fajita and this looks absolutely delicious! I might just make some fajitas for lunch tomorrow. Thanks for inspiring me! Pork tenderloin is a standard dinner in our house, because it’s lean, flavorful and easy to prepare! I usually make my own rubs and marinades, but if Smithfield has some good products, I’m going to try it! I love these pork tenderloins. They are so easy, so juicy and so delicious! Janette, this is a great recipe for grilling! Just added to my list of recipes to try soon.